Perfect deceleration even when driving extremely briskly is ensured by the AMG high-performance braking system with 360 mm, internally ventilated and perforated brake discs all-round. Particularly resistant, motorsports-tested composite technology is used on the front axle. The optional AMG ceramic high-performance composite braking system with yet larger brake discs guarantees an even higher level of braking performance as well as lower unsprung masses. Good contact with the road, meanwhile, is provided courtesy of the titanium grey-painted, high-sheen AMG light-alloy wheels featuring a new triple-spoke design and fitted with 255/35 R 19 tyres on the front and 285/30 R 19 tyres on the rear. The highest level of engineering is also reflected in the body of the new CLS63 AMG: the intelligent lightweight construction makes a significant contribution towards addressing the classic conflicting goals of low weight and high strength. 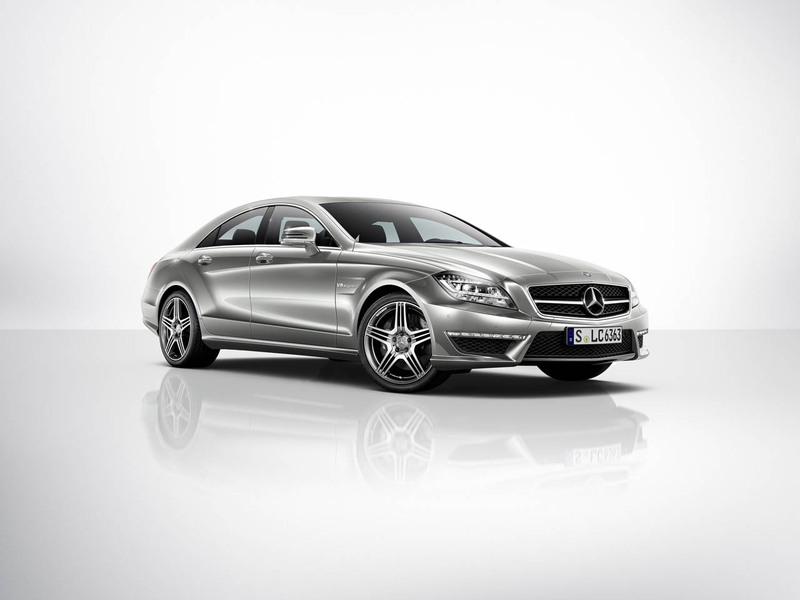 Like the SLS AMG, the Mercedes-Benz CLS63 AMG is also fitted with doors featuring a full aluminium construction. They consist of deep-drawn aluminium panels with extruded sections, and are around 24 kg lighter compared with conventional steel doors. In addition, the bonnet, front wings, boot lid, parcel shelf, various support sections as well as major parts of the chassis and engine are all made from aluminium too. The Mercedes-Benz CLS63 AMG is the first passenger car in the world to offer LED High Performance headlamps, which combine the exciting colour elements of LED technology - similar to those of daytime running lamps - with the performance, functionality and energy efficiency of today's bi-xenon generation. Fitted as standard, for the first time ever this new light system provides the Intelligent Light System already proven in Mercedes models fitted with bi-xenon headlamps in combination with LED technology. The headlamps, with their 71 LED lamps in total, underline the unmistakable appearance of the CLS63 AMG. The light specialists from Mercedes-Benz have for the first time been able to use LED technology in the Adaptive Highbeam Assist, resulting in an entirely new level of safety when driving at night. In contrast to the first vehicles equipped with LED headlamps, no compromises are now necessary with respect to the functionality and performance of the lighting technology. There are further arguments for the new, LED-based lighting technology: the average operating life of an LED is around 10,000 hours, around five times longer than that of a xenon light; moreover, LED headlamps most closely approximate the colour temperature of daylight. This means that LED light is in keeping with normal human perception patterns. Studies have shown that the closer the colour of artificial light comes to daylight, the less strain there is on the eyes. With a colour temperature of 5500 kelvin, LED light is closer to daylight (6500 K) than xenon light (4200 K). The LED daytime driving lights specific to AMG are also presented in two characteristic light strips integrated into the AMG front apron. 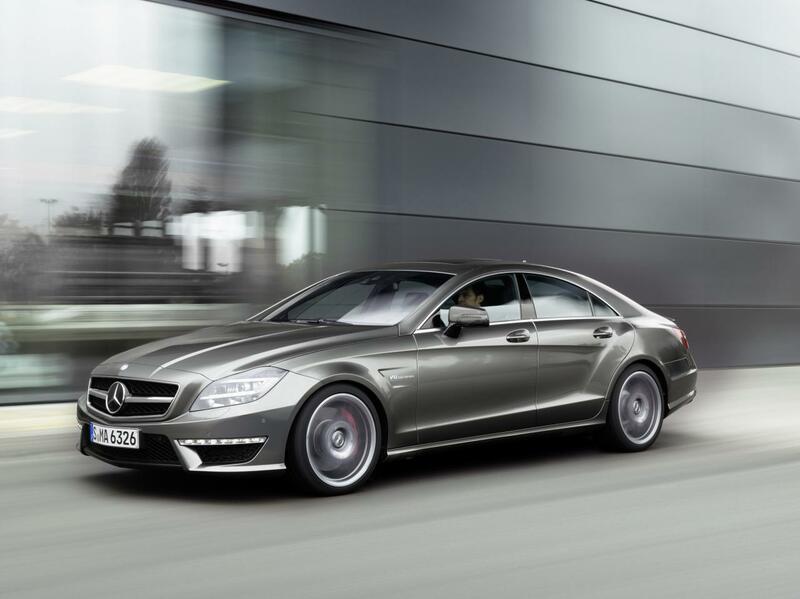 When viewed from the front, the new Mercedes CLS63 AMG evokes associations with the SLS AMG - the radiator grille in particular, with its large Mercedes star and wing-shaped horizontal slats, appears to have been inspired by the gullwing. The top-of-the-range AMG model distinguishes itself from the other CLS variants with its distinctive bonnet, wider mudguards with "V8 BITURBO" logo and a specific AMG front apron with black painted cross member. Eye-catching features at the rear include the diffuser insert, the AMG spoiler lip on the boot lid, the AMG sports exhaust system with dual twin chrome tailpipes, and - as also featured on the SLS AMG - integrated rear foglamp. The AMG bodystyling perfectly matches the typical CLS outline, which is essentially characterised by the elegantly long proportions, the lateral dropping line and the muscular sports car-like shoulder line above the rear axle. This philosophy also continues through consistently into the interior. All of the AMG-specific design and appointment features ideally supplement the redesigned CLS interior. The wrap-around effect in the cockpit, with its high line which sweeps from the driver's door over the instrument panel support and across to the front passenger door, is generously flanked by high-quality trim elements - available in black piano lacquer as standard in the top-of-the-range AMG model. Quality materials and workmanship meet the very highest of standards and help to guarantee a particularly exclusive atmosphere. The extensive range of standard appointments also includes AMG sports seats in nappa leather, a new three-spoke AMG Performance steering wheel with aluminium shift paddles and flattened top and bottom sections, and the AMG DRIVE UNIT with compact E-SELECT selector lever. Active Blind Spot Assist warns the driver if it detects - with the assistance of short-range radar sensors - that there is a danger of collision if the vehicle is about to change lanes. Should the driver ignore the warnings and come dangerously close to the vehicle in the next lane, Active Blind Spot Assist will intervene. By applying braking force to the wheels on the opposite side of the vehicle via the Electronic Stability Program ESP®, a yaw movement is created which counteracts the collision course.